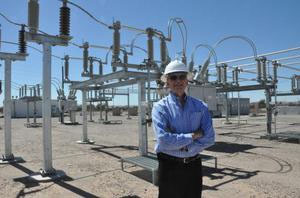 After more than a decade running Maricopa’s only utility company, Electrical District No. 3 CEO and General Manager Bill Stacy will soon retire. “The Lord has blessed me to bring me out here into the desert, and it’s been a great place to live,” Stacy said. The native Southerner worked in the utility industry for 38 years and came to Maricopa from North Carolina when ED3 hired him. He’ll work through January while preparing to teach the ropes to his replacement. Applicants have until Aug. 15 to submit resumes and ED3 hopes to hire the right candidate by November. A committee will choose a number of candidates for interviews after the submission deadline. ED3 is slated to welcome its new GM by November. Once hired, the position will report to the company’s Board of Directors. Stacy will spend retirement living at his home in North Carolina, he said, enjoying its four seasons, green landscapes and outdoor recreation. “All of our family is back on the East Coast, so I’ll spend time with my wife and family and do a little boating,” Stacy said. As he nears the end of his career, Stacy said he’s most proud of renegotiating old contracts with APS and helping ED3 become a part of the Southwest Public Power Agency, a group he chairs. Under Stacy, ED3 lowered rates 7 percent (5 percent in 2015 and 2 percent in 2017), and he said customers have not been subject to a rate increase in eight years. Stacy’s replacement will face running a company that, on its own, serves a community projected for rapid growth. Already averaging around 100 new meters a month, ED3 will likely expand to accommodate incoming commercial and residential services. The company also serves agriculture and irrigation customers. “I always say that if the growth comes too fast it could be harder on the company, but we’ve got a lot of capacity,” Stacy said. ED3’s new substation and system maintenance are two factors Stacy attributes to the company’s preparedness to handle a possible population boom. Stacy said the new leader of ED3 may face broader challenges like future power costs and renewable energy. “We’ve been here since 1926 and we plan to be a part of the community for a long time,” Stacy added.